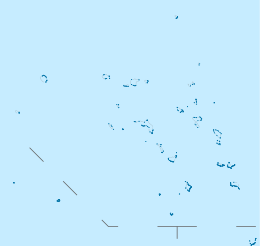 Utirik Atoll or Utrik Atoll (Marshallese: Utrōk, [u̯u͡ɯdˠ(ɯ)rˠɤk]) is a coral atoll of 10 islands in the Pacific Ocean, and forms a legislative district of the Ratak Chain of the Marshall Islands. Its total land area is only 2.4 square kilometres (0.94 sq mi), but it encloses a lagoon with an area of 57.7 square kilometres (22.29 sq mi). It is located approximately 47 kilometres (29 mi) east of Ujae Atoll. The population of Utirik Atoll is 435 as of 2011. it is one of the northernmost Marshall Islands with permanent habitation. Its first recorded sighting was by the Spanish navigator Álvaro de Saavedra on board of the ship Florida on 29 December 1527. Together with Rongelap, Ailinginae and Toke atolls, they were charted as Islas de los Reyes (Islands of the Three Wise Kings in Spanish) due to the proximity of Epiphany. Utirik Atoll was claimed by the Empire of Germany along with the rest of the Marshall Islands in 1884. After World War I, the island came under the South Pacific Mandate of the Empire of Japan. Following the end of World War II, Utirik came under the control of the United States as part of the Trust Territory of the Pacific Islands. Utirik was one of four atolls affected by nuclear fallout from Castle Bravo, the largest of the many nuclear weapon tests conducted at Bikini Atoll immediately following World War II. Research is still being done to ascertain the radiation levels, though many scientists agree that there is no harmful effect from the radiation still present. The island has been part of the independent Republic of the Marshall Islands since 1986. Marshall Islands Public School System operates Utrik Elementary School. Northern Islands High School on Wotje serves the community. ^ Brand, Donald D. The Pacific Basin: A History of its Geographical Explorations The American Geographical Society, New York, 1967, p.121. Wikimedia Commons has media related to Utirik.